[Photo] Pallas's Cat (Otocolobus manul) in the Zoo Zurich. Author Mich77. Felidae is the biological family of the cats; a member of this family is called a felid. They are the most strictly carnivorous mammals of the nine families in the order Carnivora. The first felids emerged during the Oligocene, about 30 million years ago. The most familiar feline is the Domestic Cat or House Cat, which first became associated with humans about 10,000 years ago. Its wild relative, the Desert Wildcat, still lives in the Near East and Africa, although habitat destruction has restricted its range. Other well-known members of the feline family include big cats such as the Lion, the Tiger, the Leopard, the Jaguar, the Cougar, and the Cheetah, and other wild cats such as the lynxes and the Caracal. The extinct subfamily Machairodontinae, including the "saber-toothed cats" such as the well known Smilodon, were also true felines, in contrast to similar animals such as Thylacosmilus or Nimravidae. There are 41 known species of felines in the world today which have all descended from a common ancestor about 10.8 million years ago. This taxon originated in Asia and spread across continents by crossing land bridges. As reported in the journal Science, testing of mitochondrial and nuclear DNA by Warren Johnson and Stephen O'Brien of the U.S. National Cancer Institute demonstrated that ancient cats evolved into eight main lineages that diverged in the course of at least 10 migrations (in both directions) from continent to continent via the Bering land bridge and Isthmus of Panama. The Panthera species are the oldest and the Felis species are the youngest. They estimated that 60 percent of the modern species of cats developed within the last million years. Most felids have a haploid number of 18 or 19. New world cats (those in Central and South America) have a haploid number of 18, possibly due to the combination of two smaller chromosomes into one larger chromosome. Prior to this discovery, biologists had been largely unable to establish a family tree of cats from the fossil record because the fossils of different cat species all look very much alike, differing primarily in size. The felines' closest relatives are thought to be the civets, hyenas, and mongooses. All feline species share a genetic anomaly that prevents them from tasting sweetness. Felids are purely carnivorous animals, subsisting almost entirely on other vertebrates. Aside from the lion, they are solitary, and most are secretive animals, often nocturnal, and living in relatively inaccessible habitats. Around three-quarters of cat species live in forested terrain, and they are generally agile climbers. However, felids may be found in almost any environment, with some species being native to mountainous terrain, or deserts. Wild felids are native to every continent, except Australia and Antarctica. The various species of felid vary greatly in size. One of the smallest is the Black-footed Cat at around 35-40 cm in length, while the largest is the Tiger. Compared with many other mammals, they have relatively short faces, and good binocular vision. The fur of felids takes many different forms, being much thicker in those species that live in cold environments, such as the Snow Leopard. The colour of felids is also highly variable, although brown to golden fur is common in most species, often marked with distinctive spots, stripes, or rosettes. Many species also have a 'tear stripe', a black stripe running from the corner of each eye down the side of the nose. The tongue of felids is covered with horny papillae, which help to rasp meat from their prey. With the exception of the Cheetah, almost all felids have fully retractable claws. Felids have relatively large eyes, situated to provide binocular vision. Their night vision is especially good, due to the presence of a tapetum lucidum, which reflects light back inside the eyeball, and gives cat's eyes their distinctive shine. The ears of felids are also large, and, in the smaller cats, especially sensitive to high-frequency sounds. Felids have a highly developed sense of smell, although not as much so as in canids. This is further supplemented by the presence of a vomeronasal organ in the roof of the mouth, allowing the animal to 'taste' the air. The use of this organ is associated with the Flehmen response, in which the upper lip is curled upwards. Felids possess highly sensitive whiskers, that may help in hunting at night. Felid whiskers are mainly used to keep balance, along with the help of their tails. Their whiskers also can be used as a "weapon" in extreme darkness. Most felids are able to land on their feet after a fall, an ability which relies on vision and the sense of balance acting together. The last four lineages are more related to each other than to other lineages and form a clade within Felinae. The oldest known true feline (Proailurus) lived in the Oligocene and Miocene eras. During the Miocene it gave way to Pseudaelurus. Pseudaelurus is believed to be the latest common ancestor of the two extant subfamilies and the extinct subfamily, Machairodontinae. This group, better known as the sabertooth cats, became extinct in the Late Pleistocene era. It includes the genera Smilodon, Machairodus, Dinofelis and Homotherium. The total number of fossil Felids that are known to science is not very high. Most extinct cat-like animals, once regarded as members of the Felidae, later turned out to be members of related, but distinct, families: the "false sabretooths" Nimravidae and Barbourofelidae. The true cats Felidae radiated quite recently and most of the extant species are relatively young. 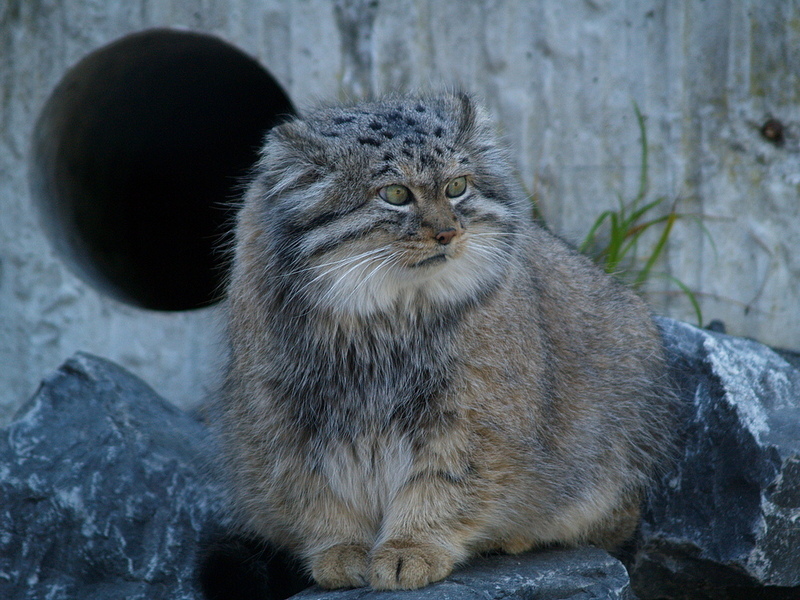 Pallas's Cat (Otocolobus manul) (or Felis manul, depending on the source), also known as the Manul, is a small wild cat of Central Asia. It is about the size of a House Cat, at 60 cm (24 in) long, not including its 25 cm (10 in) tail, and an average weight of 3.6 kg (8 lbs). Its fur is ochre in color with vertical bars, which are sometimes not visible due to the thick fur.